When AI is the engine fuelling the back end of the enterprise, it can guide employees to better advise consumers. For example, health plans have a wealth of structured and unstructured data that can be used as a training set to improve business decision making and create a continuous loop of learning. Insurers can use advanced economic models and data science to predict a consumer’s future healthcare usage and determine the best plans to meet their needs. AI also has potential to alleviate the burden of time-consuming processes, such as prior authorization and underwriting. AI is like a smart sponge—the more data it absorbs, the more intelligent it gets. As data from personal health devices, internet of health things solutions, DNA testing, genome sequencing, electronic medical records and more informs AI tools, clinicians will have keener ability to offer predictive recommendations based on a holistic view of the patient that learns over time. For instance, it could mean having insights to inform tailored guidance on the right diet and exercise plan to minimize chronic conditions, or suggestions for preventative screening to pursue, such as early testing for Alzheimer’s disease. 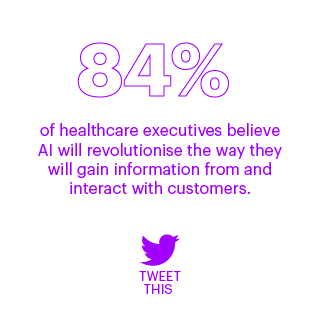 84% of healthcare executives believe AI will revolutionise the way they will gain information from and interact with customers. 72% of health organisations are already using intelligent virtual assistants to create better customer interactions.